Through our programs like First Ride and Bus Evacuation we help students to understand what they need to do to be safe around school buses. There are a few simple rules that children should follow when riding a bus. Stay seated at all times when on a bus. Do not move around the bus once you have boarded. Find a seat and stay there. Do not eat or drink on the bus because of choking hazards and the risk that other students are anaphylactic (allergic). Children need to follow a “hands off” policy with other students on the bus. Children should not engage in bullying and should report it to the bus patrol or driver if they witness it. Please be at your bus stop no less than 5 minutes before the bus is scheduled to arrive. Listen to the bus driver and follow their directions. Do not attempt to board the bus until it has come to a complete stop. Wait for the driver to signal you to cross before you cross the road. The driver is making certain all traffic is stopping for the bus. Remember to stay out of the danger zones around the bus. Remember to never go back for something that you have dropped. Every child must know the DANGER ZONES around the school bus. Children should never enter the DANGER ZONE unless the driver has given them permission. If a child must cross the street, know all the rules to cross safely. 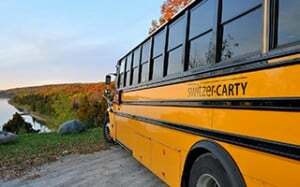 The 10 Giant Step rule is a good measurement for children to identify the DANGER ZONE around the school bus, particularly when crossing in front of the bus. When near a bus, the children must have the attention of the school bus driver. When leaving the bus, children must walk directly home. Always be on time with your school things tucked safely away. Never run to or from the bus. Wait for the bus at a safe place away from the road. Wait for the bus to stop before approaching to get on. Remember if you can touch the bus, YOU ARE TOO CLOSE! Your driver will tell you when to get on. Walk up the steps, one at a time, using the hand rail. IF YOU DROP ANYTHING IN THE DANGER ZONE LEAVE IT. NEVER, NEVER STOP TO PICK IT UP! Sit facing the driver, feet in front of you. Keep the aisle clear at all times. ALWAYS LISTEN TO AND OBEY YOUR SCHOOL BUS DRIVER! Walk don’t run away from the bus. Never go behind the bus. If you must cross the road after getting off the bus, use the 10 GIANT STEPS as a guide to take you out of the DANGER ZONE at the front of the bus. Be sure you can see the driver and that the driver sees you. Watch for the driver’s signal that it is safe to cross. Stop when you reach the edge of the bus. Look and listen both ways to be sure it is safe before you cross. Walk never run across the street. If possible, have an adult help you cross the road. Before crossing, be sure you can see the stop arm and lights flashing. Wait for the driver’s signal before you start to cross. STAY OUT OF THE DANGER ZONE AT ALL TIMES!